Fine food. Location, location, location. Great coffee. People spotting. Good service. Courtyard. Funky music. These are some of the features for your benefit we experienced when we went for a lazy Sunday Brunch at Vans Cafe in Cottesloe. Have a read & look at the experience offered. 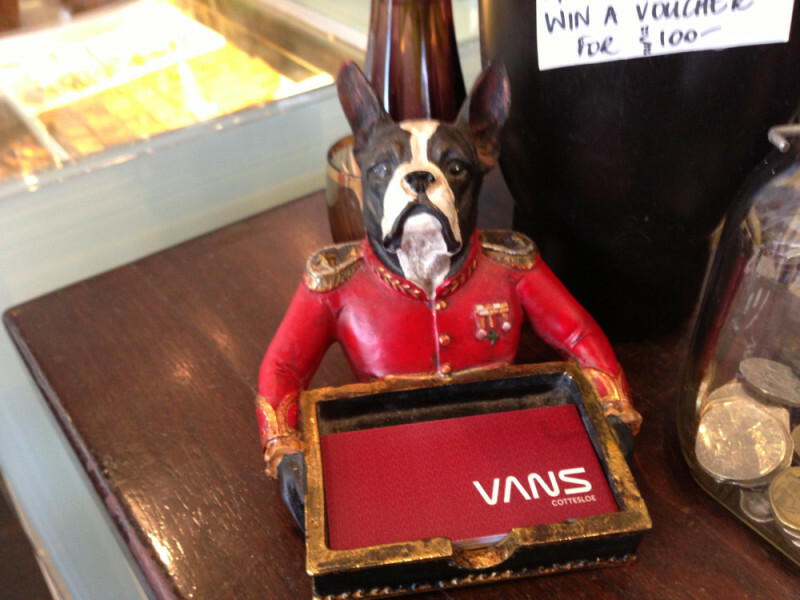 Take a stroll down Napoleon Street in Cottesloe and proudly standing at Numero Uno is Vans. Vans is a fantastic Western Suburbs foodie institution to pose like a peacock, enjoy good company, eat superb food & listen to some funky music. 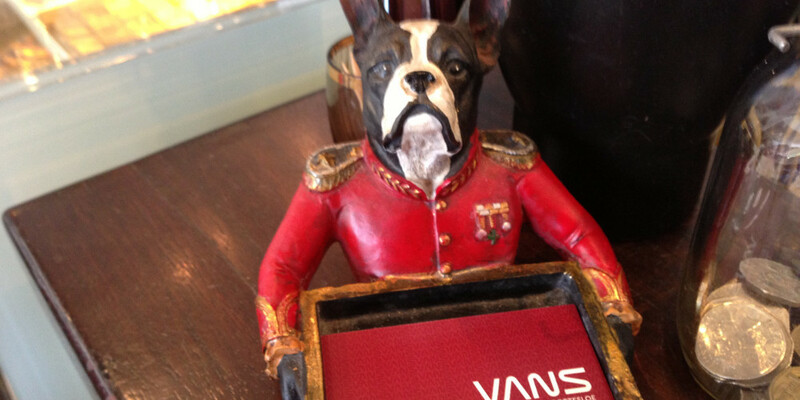 We hit up Vans for a Sunday breakfast to see what they are like & didn’t leave disappointed. Imagine an oversized Sayer’s with less cushions and you are coming close to the interior feel of Vans when you walk in to this foodie haven. Also aligned aesthetically is an outdoor courtyard seating arrangement draped with plants, fans & a very tranquil feel to your dining experience. Before we start on the food the music must get a mention. We usually don’t emphasise focus on music at The Foodie Hub however Vans played a timeless classic hit list primed with funk and served with rhythm straight. Any eatery that plays “Superfreak” by Rick James on a late & lazy Sunday morning wins cool points. Those readers that are too young to remember the 80’s dancefloor funk filler – have a preview & visualise eating food + drinking coffee to this vein of groove & funk! Service was attentive, friendly & welcoming. Then again, the locals in Cott would absolutely demand this or they vote with their feet & take their wads of cash elsewhere. We ordered some coffee to start with & were not disappointed. I am a coffee fiend & love a strong coffee bean that is bitter in taste and offset with the neutral tone of some quality dairy milk & certainly received this set of needs. Tick. Really should be a little less predictive when it comes to ordering breakfasts. You may have noticed a trend by now. Whatever the biggest breakfast is, I order. There are two ways to look at this pattern though- (i) predictability or (ii) continuity which fosters a good benchmark for comparison cross cafes! I’m opting for the latter. The menu stated the eggs come fried & the bread is sourdough. The waitperson didn’t blink when I asked if they could poach the eggs and offer alternative breads with an accommodating response. The hash brown was a stand out, again it drew memories from Sayers as their has brown is similar I found. With herbs and a home made feel. The beans were sensational. A tiny bit of spice & ting to tease the palate while offset with the more solid flavour profiles of the sausage & bacon which incidentally were both very good. The Bircher muesli with rhubard compote was ordered as well. Ladies (and Gents) do not let this one deceive you. It is a ‘creeper’ in terms of fulfilling your hungry tummies! Only about a third of it was consumed as it quite rapidly leaves you feeling VERY full when you eat it slowly. Rhubard compote was quality. Texture perfect & flavour exhuming experience & supplemented the bircher muesli perfectly. In between bites, you look around the dining room and notice the sweeping presence of it & the people within. We were fortunate & sat by the window watching he world go by. You can’t help but notice the mix of University students, lawyers, Oil & Gas Senior Execs/Board Members, Mining CEO’s and designers thrown into the clientele mix with models and millionaires. Perthanality, Patti Chong was noted enjoying a Brunch & it certainly appears to be a venue to be seen at less the pretentious empty feel. Tables providing, you can sit out on the pavement, by the windows, within the dining hall or out the back & one thing we can assure, the trip to 1 Napoleon St, Cottesloe will be worth your while. Enjoy.